The good folks at npENGAGE compiled a list of 50 Fascinating Nonprofit Statistics that covers the gamut -- from how many nonprofits there are in the U.S. (1.4 million) to how much is donated to them ($316 billion in 2012), by whom (Boomers give to more charities than Millennials) and how (online giving is growing). If you're a regular reader of this newsletter, you've read my thoughts on some of these themes. And, I'll admit, the numbers ARE fascinating! What this statistic doesn't tell you is that 50-70% of website visitors ABANDON your website at the donate page. They were interested enough to click your "donate now" button, yet they didn't complete the transaction. Are you making it easy for your donor to give online? Sure, your "donate now" button is prominent on your website. But is your website - and, more specifically, your "donate now" button - optimized for mobile? There's been a lot of talk lately about the rise of the mobile-only user. Tablets and smart phones are the new go-to online device, so you need to think about your website - and your donation page - differently. Now, that's not saying you should take your time when acknowledging a gift. What it is saying is that you should take the time to personalize your thank you notes. Toss your stale thank you letter template, and make your donors feel like every letter was written just for them. Send me a message and tell me if these three facts surprise you and why. I love hearing from you. Just like there's more to grant writing than just "writing," there's also more to fundraising than just grants. Here are three more fun facts from the full list of 50. 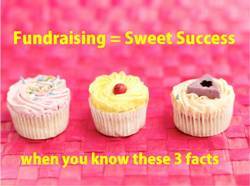 Think about how you'll approach your fundraising differently with this information.